Yummmmmm... 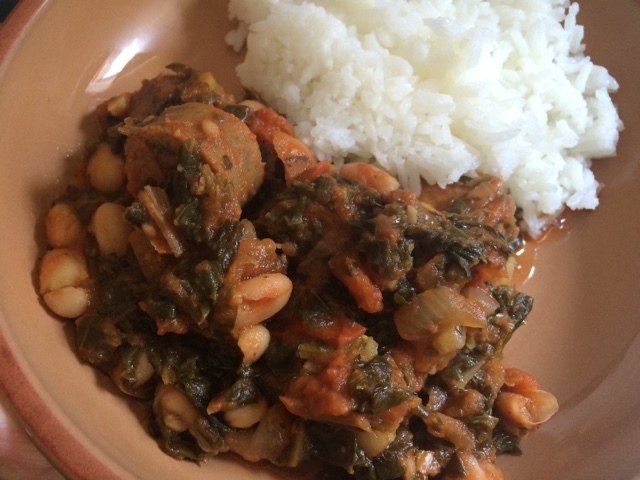 This eggplant chickpea stew is so delicious. 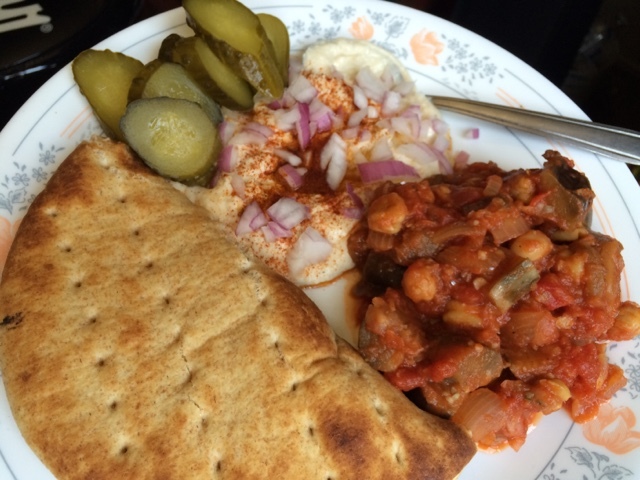 I ate it with bread, white bean hummus and pickles. 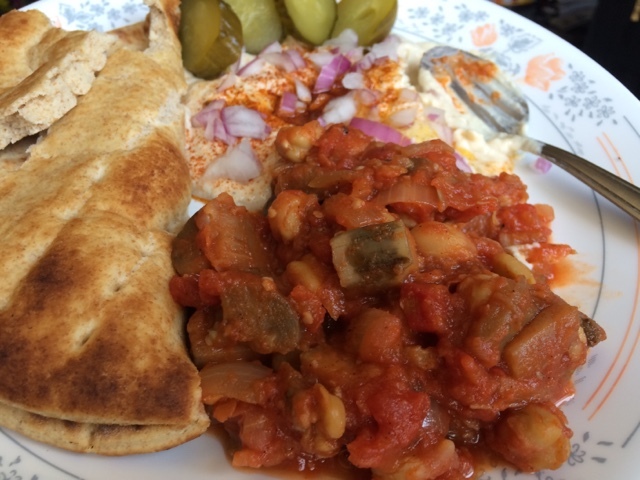 I used a recipe from Tables of Lebanon and also referenced several recipes online. They are not much different from each other. Some use fresh tomato, some use canned. 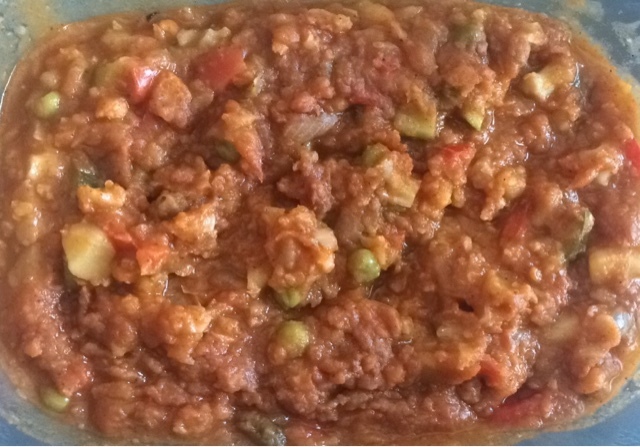 I used canned diced tomatoes plus a small can of tomato sauce. 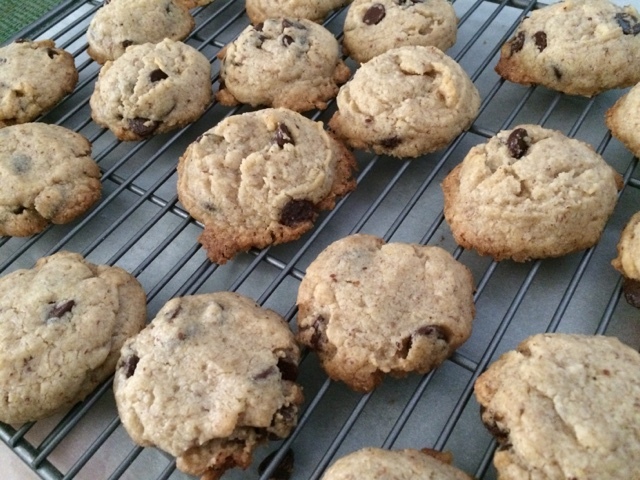 It is flavored simple with salt, allspice and cinnamon. This is the stew from The Happy Pear YouTube channel. I used frozen spinach today so that's why it's so green. It's delicious with rice. 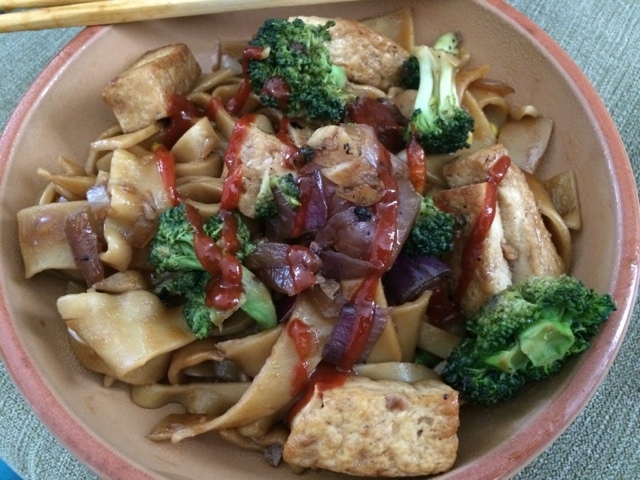 I was craving salty, spicy, saucy noodles so I made a sauce with fried onions and garlic, soy sauce, veg broth, chili oil, vinegar, sugar, Sriracha sauce and a bit of cornstarch to thicken. I ran out of Asian style rice noodles so I used some cooked lasagna noodles that I had stored in the freezer. After cooking them to desired tenderness in boiling water, I cut them into thick strips and tossed them with the sauce. 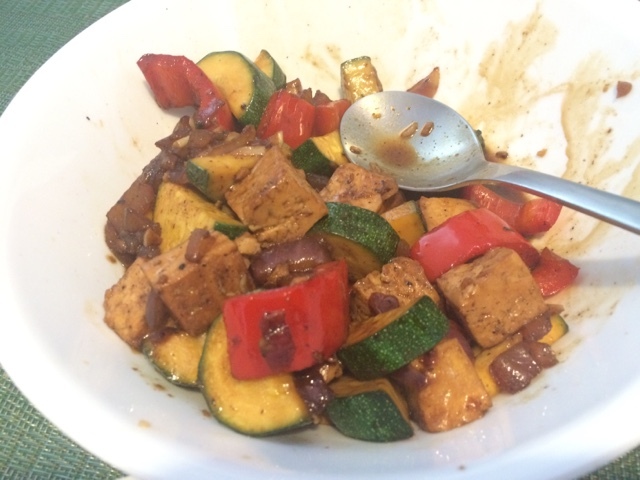 I also sautéed tofu and vegetables on the side to add on top. It was pretty tasty because of the sauce. The noodles were of course thicker and chewer as opposed to rice noodles but worked great in a pinch! 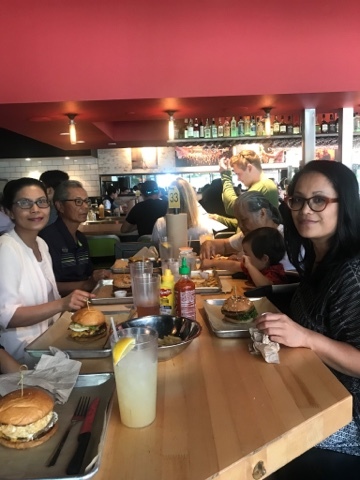 Yesterday I went to Hopdoddy Burger with family and I was happy to know that they serve The Impossible Burger. 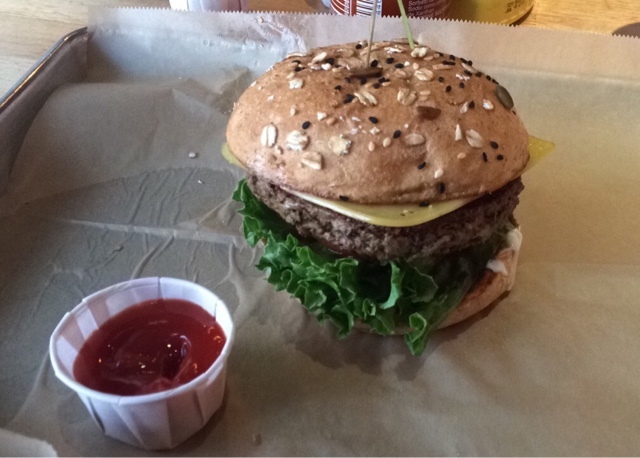 You can ask them to make it vegan and they will use Follow Your Heart Cheese and Vegenaise. 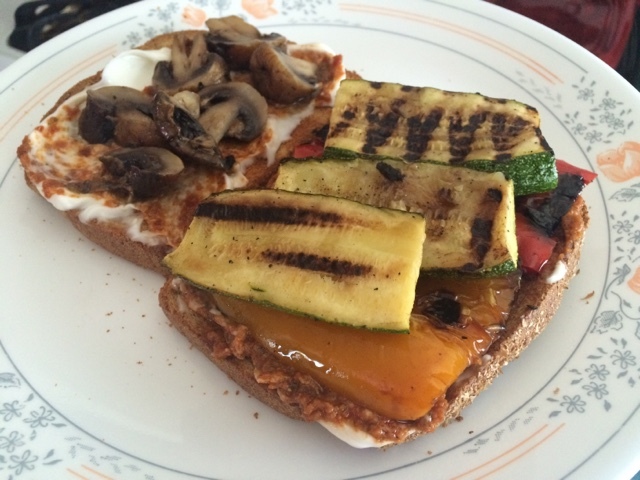 It was super tasty!!! 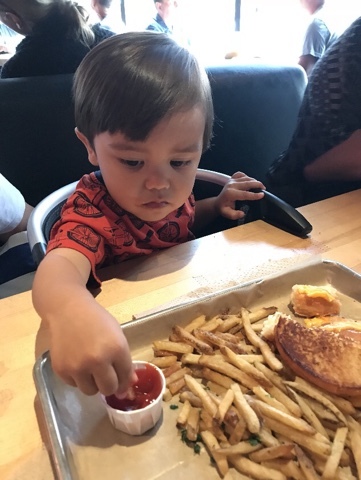 Baby had a kids meal grilled cheese (not vegan) and fries. I'm sure I could have asked them to use vegan cheese but I didn't even think about it at the time. Hank eats dairy sometimes but he is also happy eating vegan cheese when I make sandwiches at home. Cauliflower wings and breaded zucchini. 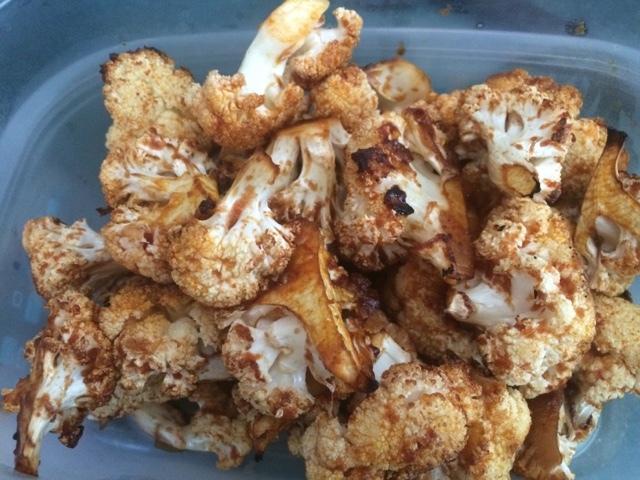 I followed the cauliflower wings recipe from The Happy Pear's new book and unfortunately they didn't turn out like expected. They didn't crisp up at all. The taste is really good so they won't go to waste. 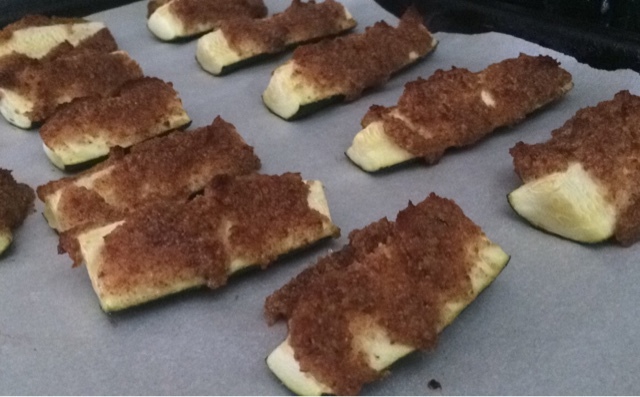 These are breadcrumbs mixed with mayo, Dijon, salt and pepper spread on zucchini and baked. My husband used to make something like this for me when we first started dating. 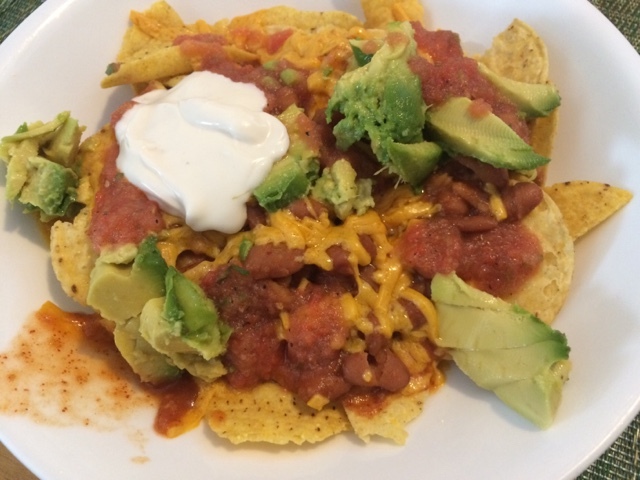 Quickie nachos: Daiya cheddar shreds on chips with chili beans in the microwave for 30 seconds. 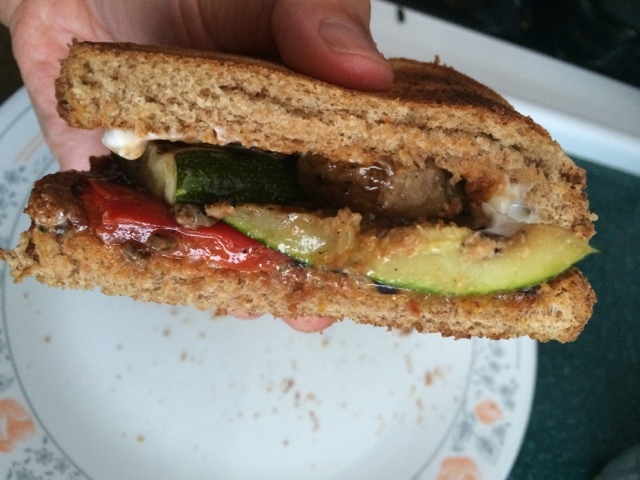 Top with salsa, avocado and Vegenaise. 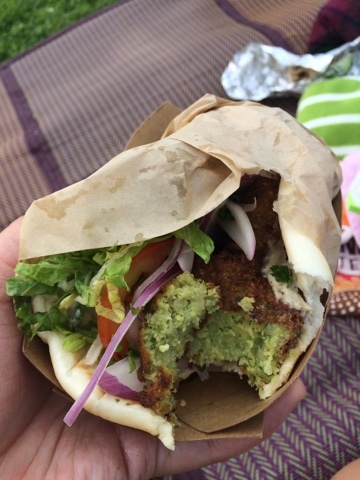 My yummy Venice Beach falafel today from Malaka Brothers Gyro shop. My dinner at home. 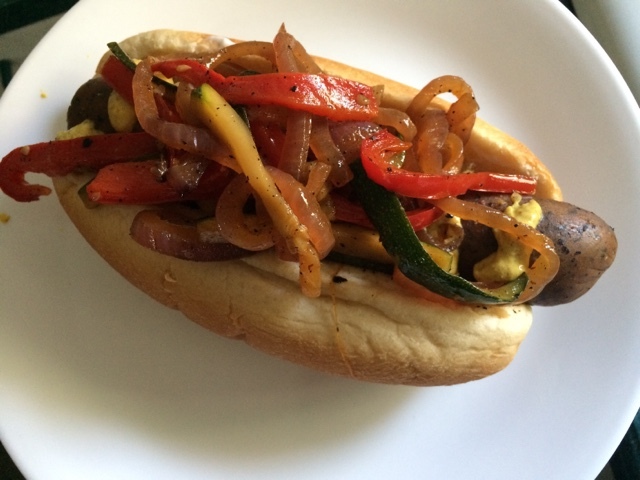 Tofurky spinach pesto sausage topped with Guldens mustard and sautéed onions, peppers and zucchini. A+! 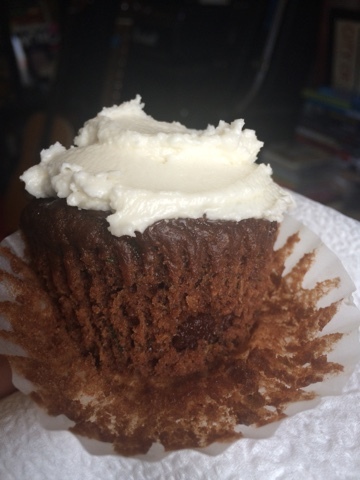 Yesterday I made Chocolate Zucchini cupcakes from Chocolate Covered Katie. 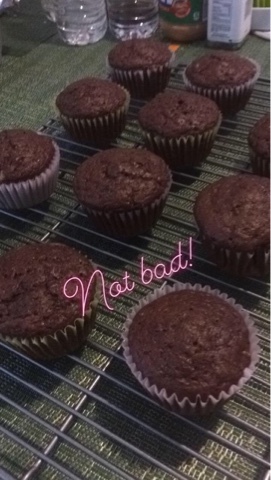 They turned very nice and they rose pretty high! 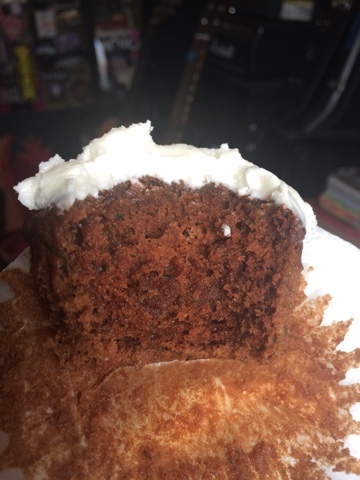 The texture was very tender and moist from the zucchini but not very sweet because of less sugar so a sweet frosting is a must! 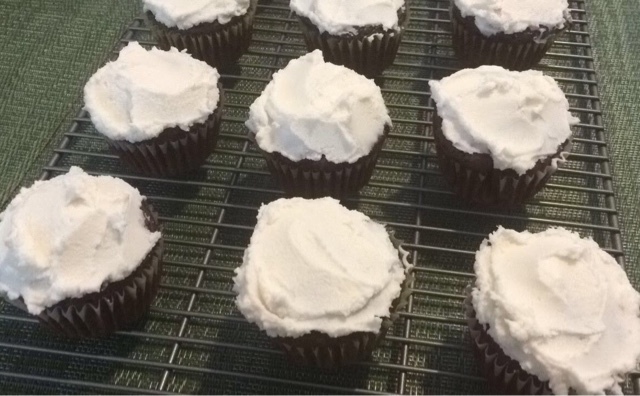 I made a quick vanilla buttercream that was perfect as a topping. 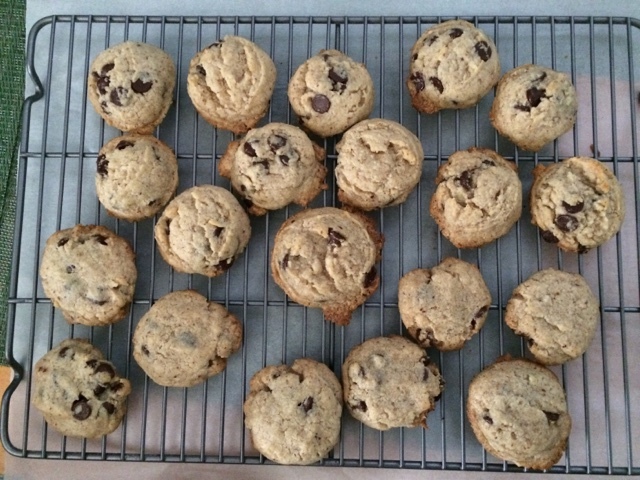 Out of the oven. Nice huh? Big bite! My son loved them too! Also made this Stirfry for lunch today. 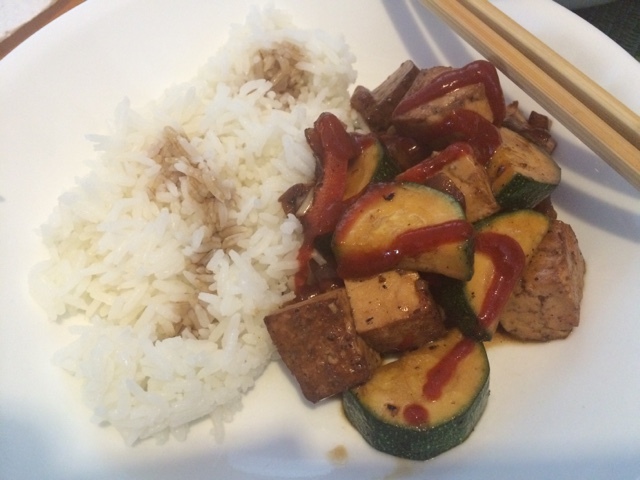 Very simple tofu, zucchini, peppers, onions and garlic stir fried with mushroom soy sauce and Korean BBQ sauce. Yes I like a bit of soy sauce on my rice and I'm Asian! I haven't made this is a loooong time! 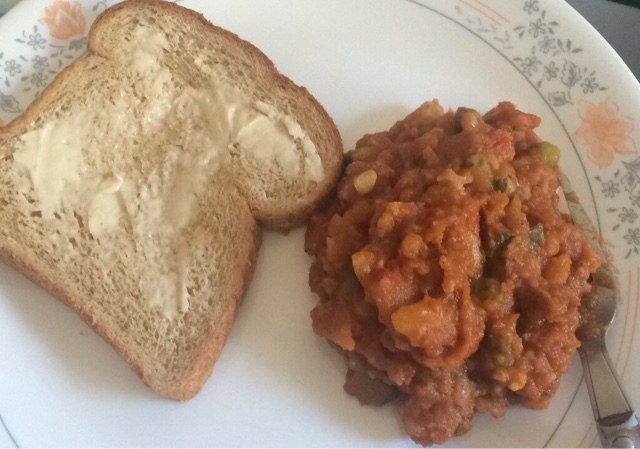 It's a thick, mushy mixed vegetable curry that is served on soft rolls. I did not have rolls so I used regular bread slices. 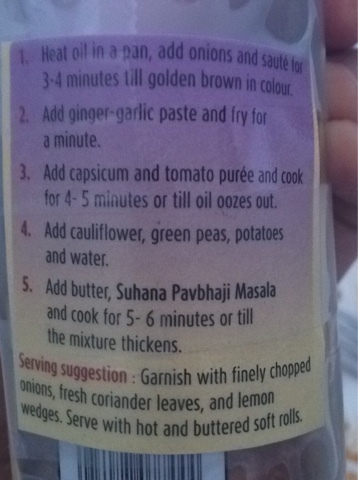 I used a recipe from the Suhana packet mix. It is wonderfully spiced and delicious! I cooked my potatoes in the microwave for 5 minutes. I also used a can of crushed tomatoes instead of purée. 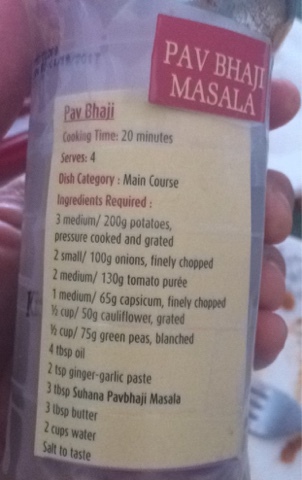 I also subbed equal amounts fresh chopped garlic and ginger paste from a tube. I let my curry simmer for an hour on very low heat. 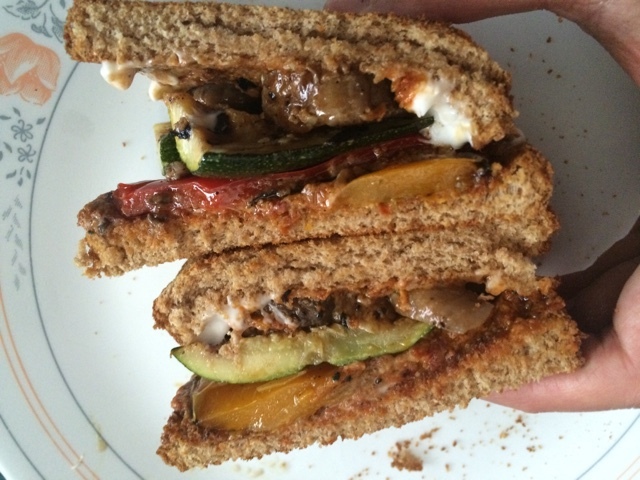 With sundried tomato pesto and mayo.